"My mother taught me this recipe, and it has become one of my favorite quick meals. I find that Granny Smith apples work best, as well as a crunchy seed bread." Preheat a skillet over medium heat. Lightly brush one side of each slice of bread with the olive oil. Place 1 slice of bread, olive oil side down into the skillet, and arrange the apple slices evenly over the top. 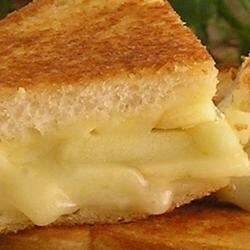 Sprinkle the Swiss cheese over the apple, then top with the remaining slice of bread, olive oil-side up. Cook until the bread is golden brown, then flip the sandwich over, and cook until the other side is golden brown and the cheese has melted, 1 to 2 more minutes. this is really good, i have made this before, but if you can find an onion bread, and use brie cheese and cook this as a grilled cheese its awsome! A good sandwich - but before you serve or eat this sandwich wait about 2-3 minutes. That way, the flavors meld a little better. This sandwich is one our family favorites! Try adding some well-cooked bacon before grilling! YUM! DELICIOUS!!!! the kids and adults loved it! I will definitely make it again and again!